As I was beginning to plan where to put all my shelves in the art studio, I realized I didn’t have enough wall space. I decided to build a wall between the two halves of the studio to give me room for all my hanging shelves. 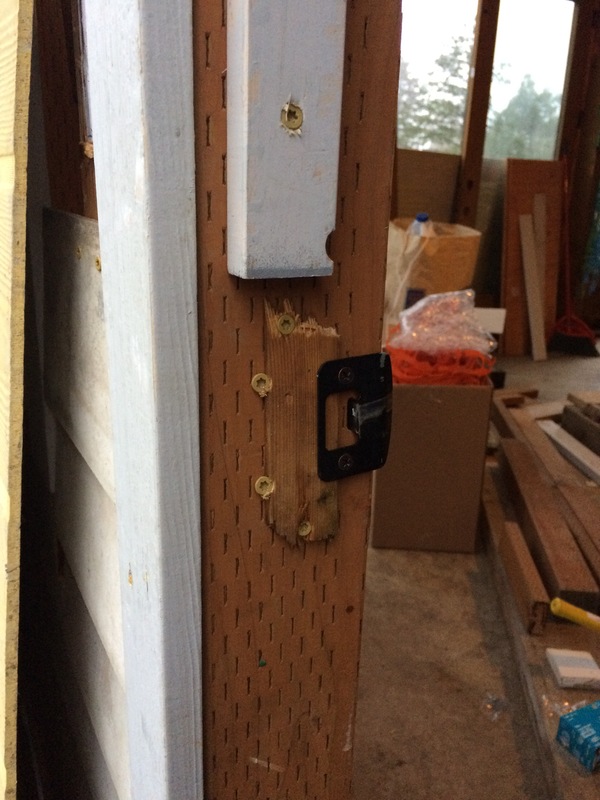 I didn’t like how closed off it felt, however, so I cut a large opening in the wall at eye level to open up the space. Since that leaves me only half a wall when I needed a whole wall, I’m also putting half a wall between the breeze through and the far section of studio. That will allow me to mount all my shelves and still have a view of the entire studio as well as the horse corral and yard. I thought I would be done with my studio before Thanksgiving but, as I should have known, projects always take 2 to 4 times longer than expected. New pasture for the horses. The neighbor behind us used to have sheep in this pasture. Unfortunately the sheep were killed by coyotes and the pasture has been farrow for a few years. I finally got a hold of our neighbor and he said I could use the pasture for our horses. I built a little gate and let them out into the long grass. They wandered around a while looking bewildered but now they are grazing up close to our back fence. I guess they don’t want to get too far away from home. I can’t say I blame them. I love being here myself. Another toy for Ryan and me. 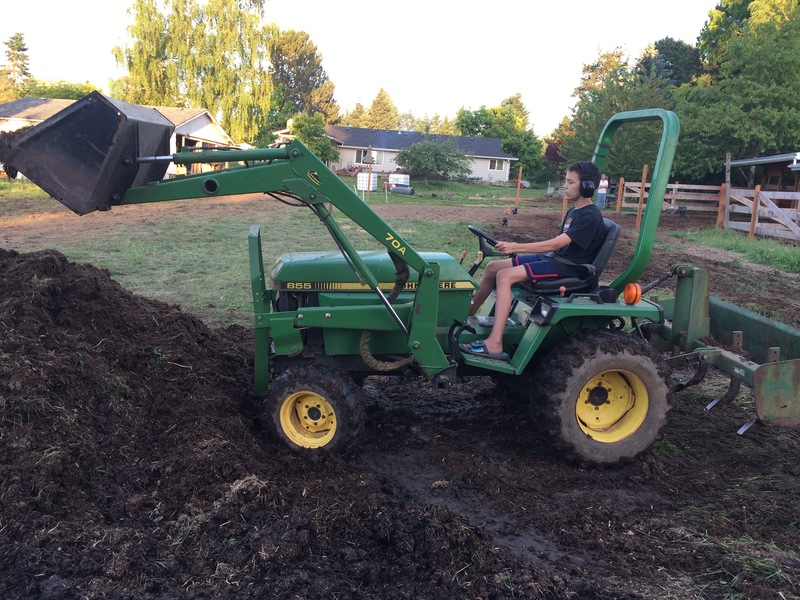 I borrowed a friends tractor and had a great time grading our back half acre. We smoothed out the pasture area and created a nice slope in the new barn area where we will be building this summer. Also, spent some time smoothing out the old garden to extend our grassy back lawn. The new barn area will have a solid run of packed gravel base and pea gravel on top to keep the horses feet out of the mud this winter. We will also have a hay barn included so that we won’t have to drag the hay on dollys through the rain to the barn! We are building 12 small structures to make our new barn. Each structure is under 200 ft.² and can stand alone. I drew so many plans before I finally settled on one. The planning is so fun. I kind of love projects. We Ain't Cold, We're Vikings! Would I have been out here in the snow if it weren’t for Cheryl? . . . no. Ha ha! I found working in the snow wasn’t that bad. Of course, I had on the big fluffy down jacket my dad gave me a few years back when I still lived in Florida. Glad I have it now! Also, under my long skirt I had on stretch pants. Then there are the Ugg type boots I was wearing, a great thrift store find . . . and a scarf to keep my ears warm. Yeah, we’re tough. We’re Vikings. We’re well insulated Vikings! We worked to get the outline of her rooftop done and tarped, so her “tiny house” aka her studio, could be covered from the rain and snow until she can work on it after this new semester. We worked and worked, then had to go in to rest and get warm. Then back to work. We paced ourselves because we just don’t have that much stamina! 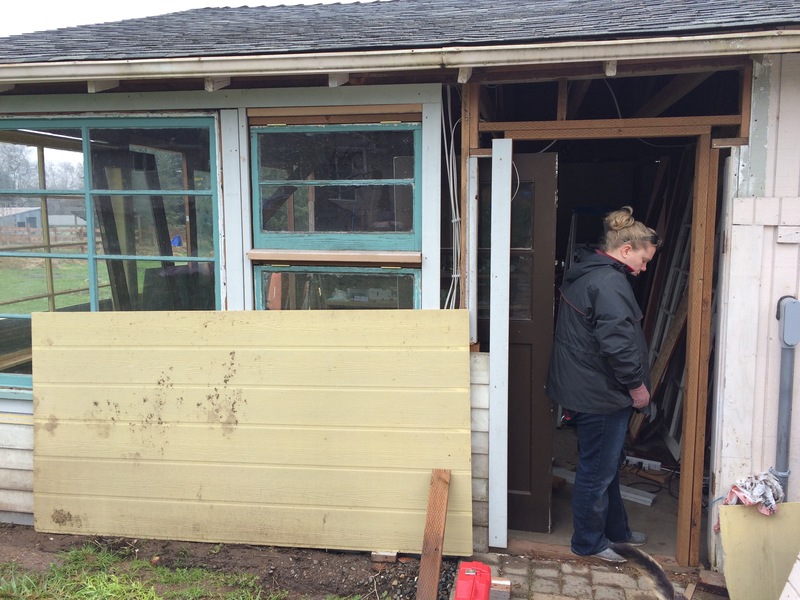 We did not get the tiny house along as far as we had hoped, but we are close to the goal. Today (Sunday) was to be her last day to work on it before school starts for her. She had been working through her winter break on the structure, even when sick, and today she was really under the weather so we decided to rest. I was glad we were resting because I was exhausted and I’m not even sick! Here are some more photos of our working yesterday. Before we started the roof bones. Cheryl attaching things while I hold rafter steady (out of picture). MMMmmm HHhmmm . . . Looking good! Yipee! Done for the day. Getting dark. View out the double doors on south west side. I do love building projects, especially ones like this which will be so beautiful when finished! I wouldn’t choose to work in this weather, however, Viking or no. We Ain’t Cold, We’re Vikings! How crude can it be and still work? 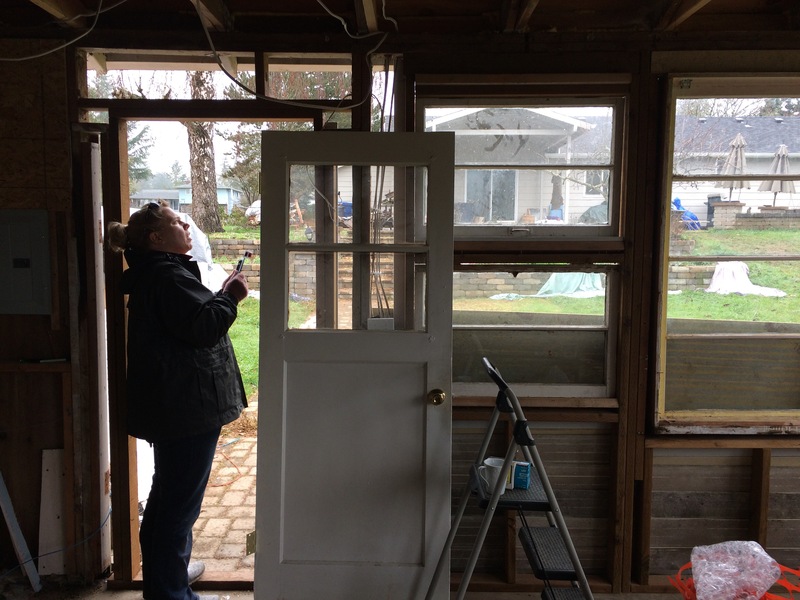 The day was warmer, and Melanie was over, so John and Melanie and I finally put the front door in on the art studio cottage. Watch video below to see how amazingly it works! 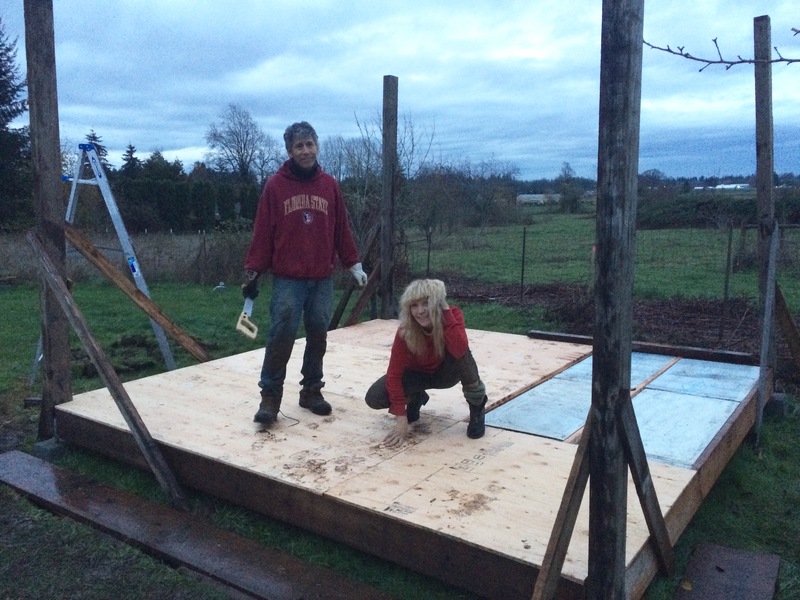 As the sun sets slowly in the west, Cheryl and my husband John put plywood on the joists of Cheryl’s tiny architect studio. Between the joists are some of the 4 inch thick rigid foam insulation pieces given to her through Craig’s list. On sprinkely overcast days like today, sometimes I feel like just staying inside the nice warm house, but when I get outside and help with a project I always feel so invigorated and happy afterwards. Then when I go in the house I feel like I’ve gotten something accomplished. 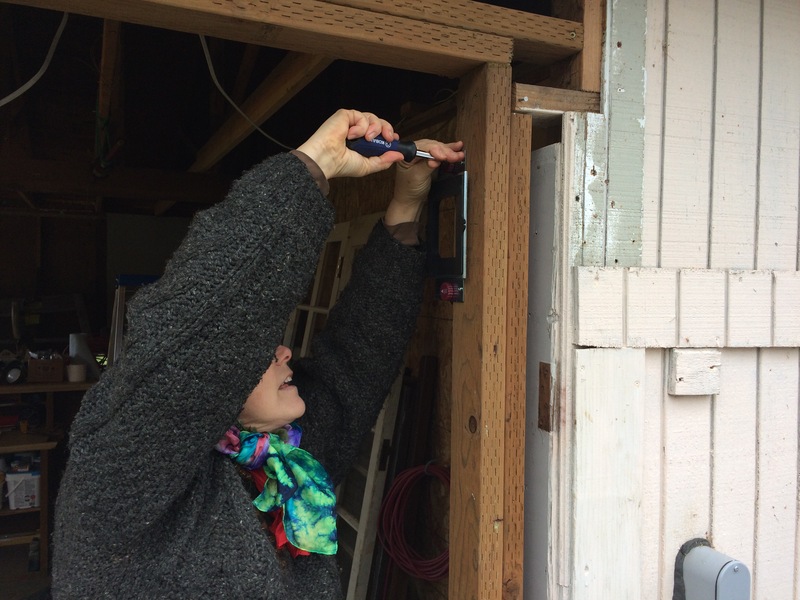 Today, while Cheryl and John worked on her studio, I spent my time outside insulating the pipes that run to the automatic watering troughs in the barn and fixing a broken latch and taking care of the horses with Ryan.